This Tampa roof cleaning project is of flat steel roofing material being prepared for coating. The steel was cleaned with a bleach application and pressure washing. This was in preparation for Pro-Cryl Industrial Primer, followed with Sher-Cryl High Performance Acrylic Coating. 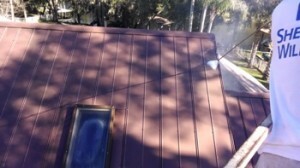 The goal of this roof cleaning was to remove all oxidation and mildew. The steel did not have a lot of mold and mildew but using a light bleaching solution is always good measure just in case. Our roof cleaners ran a 1% bleach solution coupled with TSP to help loosen oxidation via our downstream injection system. The entire roof was rinsed down with this solution. Ever notice when you rub your hand across an old painted exterior surface you sometimes find a chalky residue? This is the coating oxidizing from the sun. This chalk must be removed to ensure the coating properly adheres to the steel. The TSP in our roof cleaning solution coupled with pressure washing the surface will ensure all chalk is removed. This roof was pressure washed from a man lift to ensure all areas were cleaned safely. 2555, 2509 spray tips attached to a 12 foot aluminum lance were used to remove the years of grime. Our roof cleaners like to use articulating man-lifts on tough projects like this one. 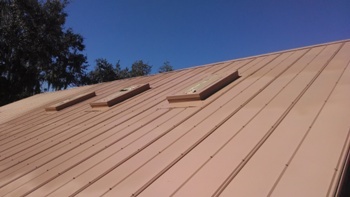 Metal roofs can become very slick and tough to safely work on when wet, even when tied down. 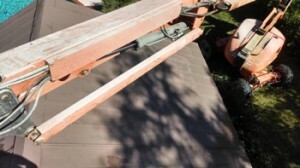 We often utilize man-lifts to safely clean roofs and are very experienced using the equipment. With this project we used a 60 foot articulating lift to be able to clean and coat all areas of the roof. Walk boards are used under the 24,000 pound lift to minimize damage to the grass. Once our roof cleaning crew was done washing down the steel roof we prepared for coating. All of the skylights were covered with paper and tape along with over spray areas. Some spots on the steel required a quick scrub with a steel brush before priming. The industrial primer spec’s inhibit minor rust after removal and roof cleaning.